Tad: Kelly, you are known around New Orleans as not just a poet, but also as a “literary activist.” Assuming you consider that a fair descriptor, what does it mean to you to be a “literary activist”? Kelly: I don’t know what people mean when they use the phrase literary activist. I hope it means I’m a good trouble-maker. I care about how people are cared for, especially when it comes to literacy and the literary arts. I’m involved in two organizations whose work is about service to both children and women in this city as it relates to literacy and literary equality. I work in the adult literacy field. Each day I see how illiteracy affects an individual’s ability to fully participate as a citizen in society. After Katrina an alarming number of residents could not get the assistance they needed because they couldn’t read or read well enough to understand the forms. During the BP Oil Spill, The Literacy Alliance of Greater New Orleans was hired to take BP claim forms and convert them into plain language. Again, people couldn’t get services due to them because of literacy and language barriers. Two things concern me greatly about literacy in New Orleans: 1) I believe literacy is a justice issue. It’s always been a justice issue. If Black folks didn’t know how to read and interpret U.S. laws, we’d still be in courts fighting Jim Crow. The current language on ballots and in proposed legislation is becoming so purposely complex that many people may not understand how to vote. 2) Each day it becomes clearer that much of adult education is about getting learners to achieve specific benchmarks, but we rarely get an adult learner or, let’s say a GED graduate, to the pleasure of reading. I want to take GED graduates on field trips to local bookstores and libraries to make reading applicable in daily life beyond passing a test or applying for a job. TB: So it sounds like you have taken way more on your plate than what is commonly perceived to be the typical job description of “poet”? KH: I am interested in how poetry can function in public places beyond bars and traditional readings. Too often writers are reading to the choir. The other day a woman came up to me in the grocery store and said, “Aren’t you that poetry lady?” There’s a certain gratification in being recognized by a non-writer. There’s a special relationship in New Orleans, it seems, between community and artists. Many of the artists in New Orleans themselves are an extension of the community. I don’t sense that artists here seek to dictate what art is or its function. Go to the French Quarter and people are artists because they say so (for better or worse). 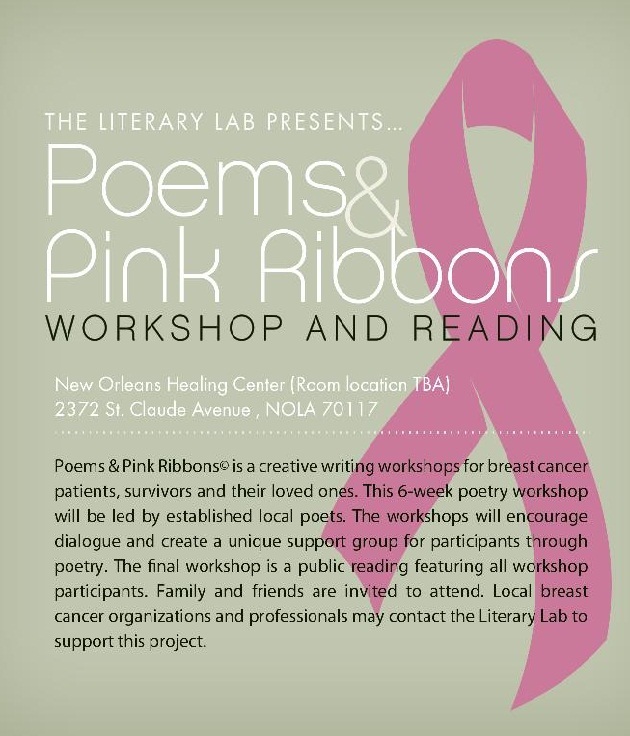 Poems and Pink Ribbons [tb: a workshop and reading series for breast cancer patients, survivors and loved ones, presented by the Literary Lab with a final reading and celebration on October 22 at 2372 St. Claude Avenue] was in my heart for about four years. I just sat on it. The combination of having a mother who survived breast cancer, and a mother-in-law who didn’t, provoke me to want to honor them with service. 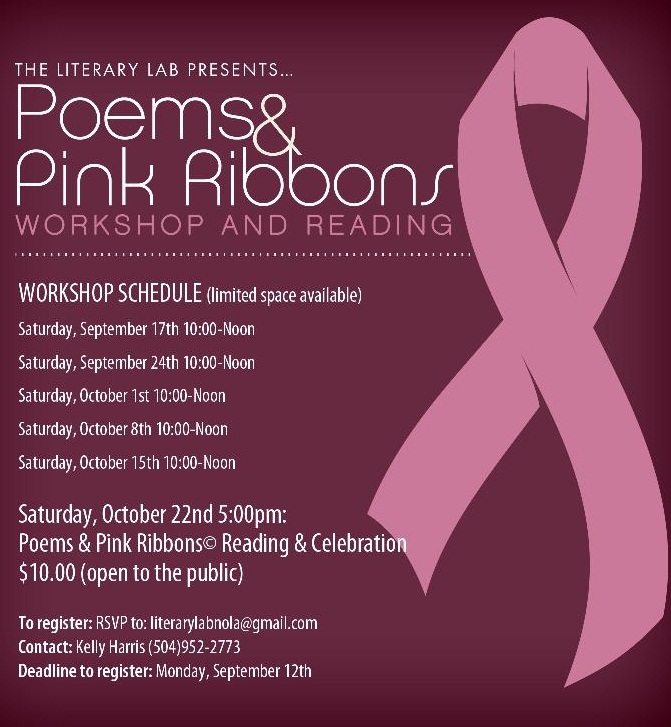 Everybody wears pins and walks, but I wanted to do something more impactful, hence Poems & Pink Ribbons. Different poets around the city have volunteered their time. The majority of the participants probably wouldn’t have called themselves “poet” prior to the workshop. They’ve become more organized, more serious poets as the weeks have gone by. One lady even has a binder and she organized her binder into class notes, poem hand outs and poems that she’s been writing. Poems & Pink Ribbons has an engine of its own now and I am just along for the ride. 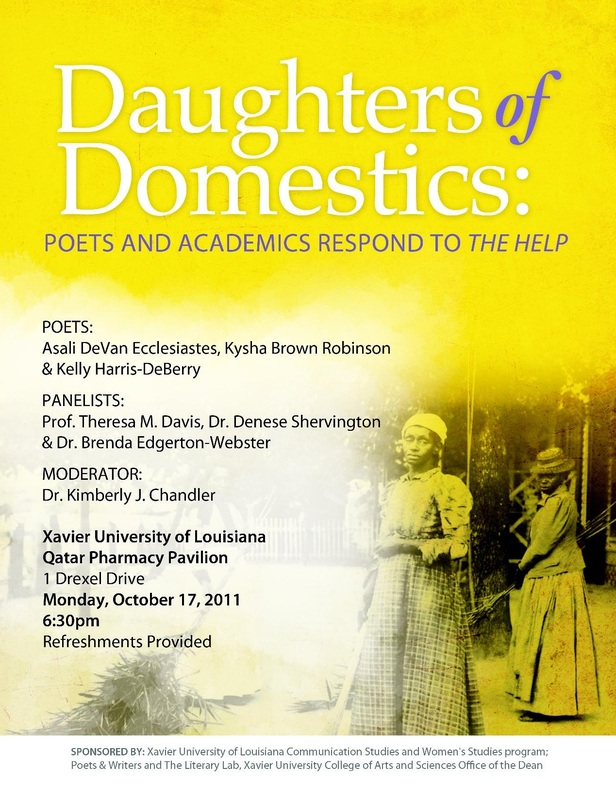 Another event that is drawing interest from beyond the universe of writers is “Daughters of Domestics: Poets & Academics Respond to ‘The Help’.” [tb: a response to “The Help” by poets and academics, on October 17 at 6:30 p.m. at the Xaview University Qatar Pharmacy Pavilion at 1 Drexel Drive]. It started from a poem I was writing about my own mother, who at various times in the late 80s and 90s cleaned homes for white owners. My mother turned 60 this year and for some reason it made me go public in my poetry about my mother’s cleaning days. Five months later “The Help” was released in theatres. TB: What responsibility do you think that writers have beyond the mere expression of an idea or the telling of a story? KH: I can’t say what other writers should be responsible for. I can only say I feel a responsibility to write well and with care about everything. A janitor approached me after a reading and said, “I don’t like poetry, but I like your stuff,” and I asked him why he didn’t like poetry, and his answer suggested that he didn’t know poetry could include him. I suggested some books and poets for him to read; I hope if I ever run into him again, his views on poetry will have changed. I’m told my great-grandmother wanted to be a poet. I never met her. Apparently her ability to recite poems to her children in her living room and in church was electric. She was laughed at in her community and scolded about staying in her place. So I do kind of feel this responsibility to be true to the people and things that have impacted my life. KH: Like photographers, I think poets should use a wide range of lenses to capture different angles and depth in their work. 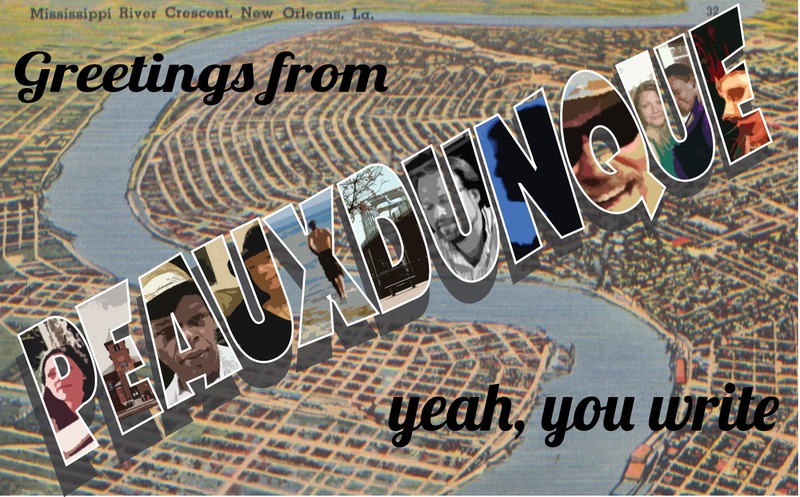 The poem functions as a New Orleans lens. The MJ second line closed the gap between icon and fan. MJ, this larger than life person, became a marcher, strutter in the line. There was some controversy about having a second line for Michael Jackson because he’s not a N.O. musician and because of the molestation controversy. However, the second line is about burying and blessing the hurt, The people are the judges; they deem who’s worthy of the ritual. It was fascinating that this larger than life person becomes everyday people – everyday New Orleans, if only for a moment. I’m from the Mid-West—Cleveland, OH. Many of my poems reflect blue collar ideals. I must admit moving South has sharpened my sense of place and people in my work. TB: Another of your poems, “A Pissed Off Bird,” gives voice to an avian spokes-bird with a long list of grievances about the ruin the human race has made of birds’ initial deal with God. It swerves from acerbic humor to a lush imagining of a bird’s uninterrupted world, to dead-on social commentary. Is this a hard balance to strike, to keep the pace in a poem, to address serious social issues, and at the same time avoid any semblance of preachiness? KH: A local music writer once said, a good trumpeter resists playing every note and trick he knows. Many singers ruin the National Anthem because they can’t resist oversinging. Ever felt like you just heard an audition instead of the sacred song? I think poets have to resist making junk drawers out of poems. It’s hard to create balance in life and poetry. And sometimes you just have to resist saying yes to everything both in life and in the poem. I’m learning that less is definitely more. It’s all about discipline. I wrote that poem during the BP Oil Spill. I remember being in a certain part of town and feeling as if I had walked into a gas station. You know I never wrote an ecology-themed poem until moving to New Orleans. KH: I wish I had some fascinating story about growing up around books or having parents who were educators or getting a book I couldn’t put down, but neither is the case. The short-story is: I didn’t grow up knowing a lot about poetry. As a child, I recited Easter speeches in church. I wrote my first poem in 6th grade. It was called, “Be a Leader not a Follower”; I guess even then I was grappling with social issues. I showed it to my father. He said, You know that’s a poem. That’s how I knew I’d written my first poem. Then, I had no concept of being a poet. Poets aren’t invited to Career Day. I wanted to be a pediatrician until high school, until I introduced a poet named Mwatabu Okantah at a school assembly in ninth grade. I was hooked and quickly learned that having notebooks of poems was no fluke. I learned I couldn’t live without making poems. Something kept drawing me to the page, catching my eye, pulling my ear. Next thing I knew, whoa, I’m a poet. TB: What is the best piece of writing advice you have ever received or given? Many thanks to Kelly for this fascinating discussion. We look forward to hearing her work at Yeah, You Write, at Tipitina’s Uptown on October 13th.